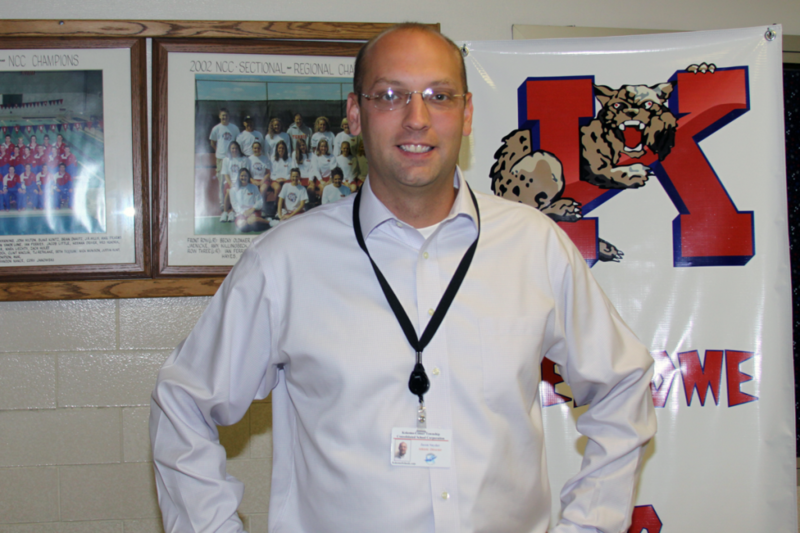 Jason Snyder is the new Top Kat in the Kokomo High School athletic department. Kokomo High School has a history of long-standing and successful athletic directors. From 1972 through June, only four men had the distinction of leading one of the most successful high school athletic programs in Indiana. But with the start of this school year, Jason Snyder added his name to the list that includes Bob Hamilton (1972-1984), Ron Barsh (1984-1987), Jim Callane (1987-2005) and Mike Wade (2005-2011). But not since Hamilton has a Wildkat athletic director attempted to do what Snyder will this year – coach a major sport at the same time. Yes, Snyder will remain as the girls basketball coach. “I will lean on a lot of people, and I have an outstanding coaching staff that has been around the program for the last six years,” said Snyder. “This is a dedicated group of coaches and they know I will put my time in. The first year will be the toughest, but it is something I want to do. I really like coaching the girls and am not ready to give it up. Snyder’s girls basketball coaching staff consists of Lisa Pflueger, Jay Karp, Troy White, Jesse Dunn, Daro Johnson, Josh McFarland and Russell Dance. He is 67-38 as the chief Lady Kat, a position he has held since Howard County Sports Hall of Fame member Charlie Hall retired from coaching in 2006. The new athletic director also pointed out that he talked to several people before making the decision to serve in both a coaching and administrative position. Snyder won’t be the only AD in the state who serves as a Class 4A basketball coach. J.R. Holmes is the athletic director at Bloomington South as well as the boys basketball coach – and most Kat fans remember what his squad did to the Red and Blue last March. Snyder may be the busiest employee in the Kokomo school system. Not only is he athletic director and head girls hoops coach, but he is still the boys varsity golf coach. Until that decision is made, he is excited about the athletic director’s position, wearing multiple hats, and what the first month has brought. The new AD also points to a coaching staff that he is looking forward to working with. Snyder said the staff is one of the best in the state. Snyder is the first Kokomo alumnus to serve as athletic director in decades, something that is not lost on the 1995 graduate. Looking into the future, Snyder said he wants to place an emphasis on getting the Wildkat student-athletes into the community, showing the positives of the school and the athletic program. Snyder also mentioned his wife of nine years and the support she has shown, not only to him, but to the entire athletic program at KHS. And Kokomo faithful should be excited about having an athletic director who bleeds Red and Blue as much as Jason Snyder. It appears he will fall in line as another legend, much like mentors Barsh, Callane and Wade. This entry was posted in High School, Kokomo. Bookmark the permalink.